c. ebs 2004 24" x 30"
Painting commissioned by Joe Preston (Jackie Curtis' cousin). Joe will offer the painting for sale on eBay sometime later this year. 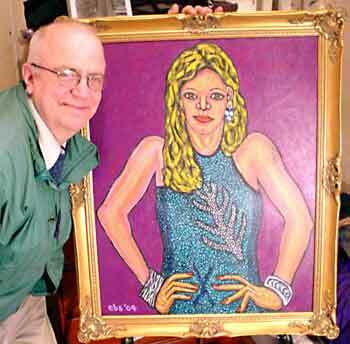 Who would imagine on March 31, 2004 that this artist would complete this work, "Jackie as a Blonde," on April 23, 2004. While viewing my animal paintings inside Ryan Chelsea-Clinton Community Health Center lobby, it seemed pretty far-fetched when Joe Preston, cousin to Jackie Curtis Ð famed Warhol Superstar, proposed the commission of Jackie's portrait. We both agreed that the task of completing this piece before the May 5th, 2004 New York City opening of "Superstar in a Housedress, the Life and Legend of Jackie Curtis," would be ambitious and probably undoable. The process that unfolded was one that I'll never forget. I was a co-actor/performer and friends with Jackie Curtis from 1980 until his transition in 1985. We became roommates when I found myself homeless in November 1981 and Jackie welcomed me as part of his family which included his cousin Joe Preston and his aunt (Joe's mother) Josie Preston. During this period, Jackie, whether dressed as a woman or a man, would walk about as a blonde. He would insist on being glamorous even when a role offered her was to the contrary; for example, the part of Mrs. X in the 1980 play, "Tyrone X," by Nick Markovich. I was honored to perform opposite Jackie Curtis in that play as her poor hapless and tortured husband, Mr. X. Later, in 1983, I would perform multiple characters (all unsavory) opposite Jackie's characterization of Francis Farmer (blonde) in the 1983 La Mama, ETC production of "I Died Yesterday." Getting back to April 2004 with a daunting task at hand, even with my past association with Jackie from 1980-1985, I needed photographs of Jackie in as many of her/his recorded incarnations as could be found. My eternal thanks go to Joe Preston and Mona Robson (Jackie's closest confidant) for their invaluable assistance in this regard. With the photos procured, I went about making sketches from each of them while seeking Jackie's soul essence for assistance. If I couldn't connect with Jackie on the 'other side' there could be no true rendering of this portrait. There were times when I thought the task was too much, especially when my full-time job and the illnesses with several of my family members seemed to conflict. When that happened, I would get a surge of energy (from guess who? ), get real, and then plow forward. In other words, what could have taken many months took a few weeks. It is my fervent hope that you, the viewer, will see reflected in this work many of the extraordinary facets that composed Jackie's being while he was here, and beyond. God bless you Jackie !! !